MAZOMANIE – The caravan rolled slowly down Brodhead Street past the Mazomanie Historical Society, crossed the railroad tracks and took a right on Hudson Street to stay on County Y. 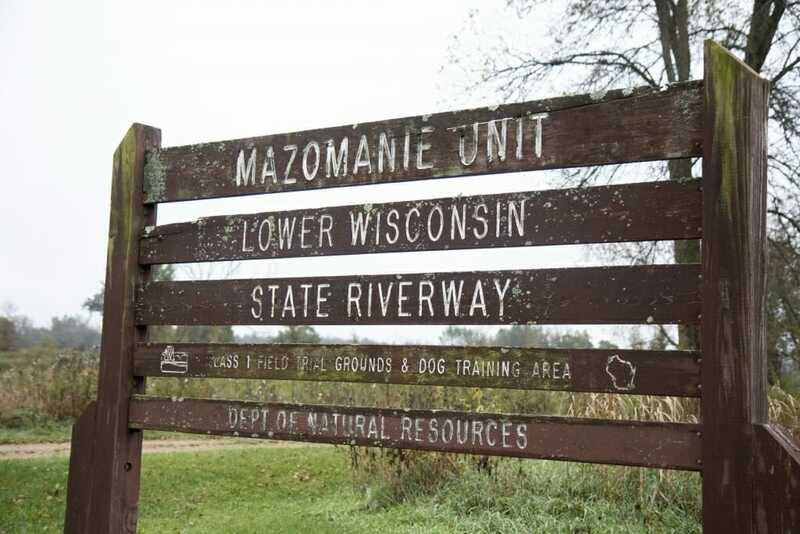 Three miles north, the vehicles pulled into the parking lot of the Mazomanie unit of the Lower Wisconsin Riverway, quickly overflowing the spaces on a gray and drizzly early October Friday. 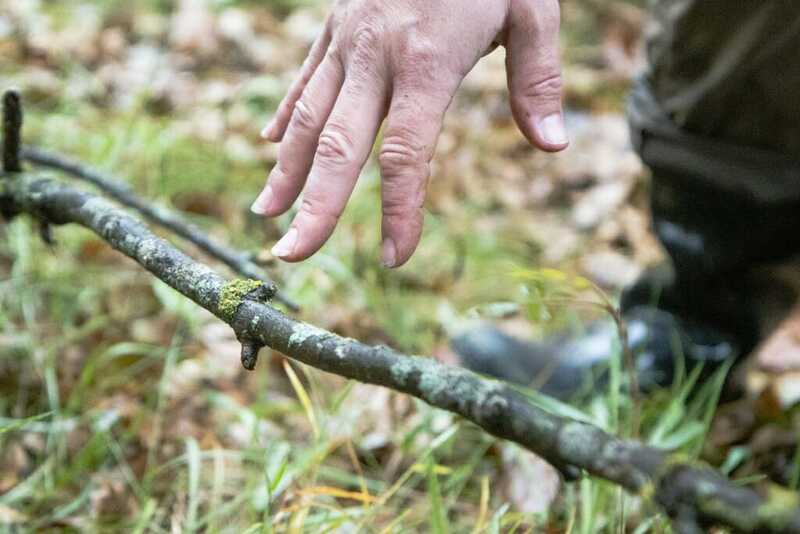 From the cars tumbled dozens of mushroom hunters, mycologists from around the Great Lakes and as far away as Norway searching for new study material. They assembled baskets, trowels, cameras and magnifying lenses — the only tools they would need. Directions were brief: go into the forest, find your way back around noon for lunch. 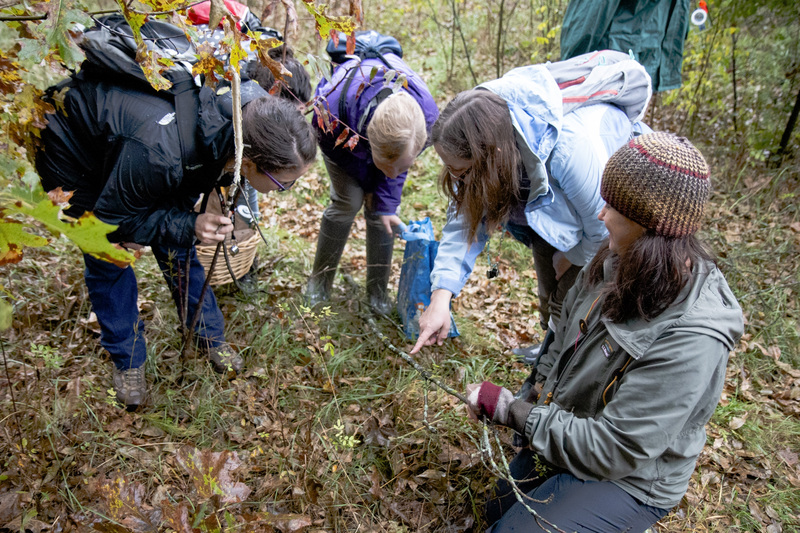 Anne Pringle gathered with several graduate students, instructors and visiting mycologists. About a foot into the stand of pines, other teams disappearing into the trees, Pringle’s group dropped to their knees. Pringle, a professor of botany and bacteriology at the University of Wisconsin–Madison, stooped to investigate a pale tan elfin saddle, quickly scooping the mushroom up into a wax bag and dropping it in her basket. Enticing samples started pulling group members deeper into the woods, thwarting any attempt at keeping the team in one piece. 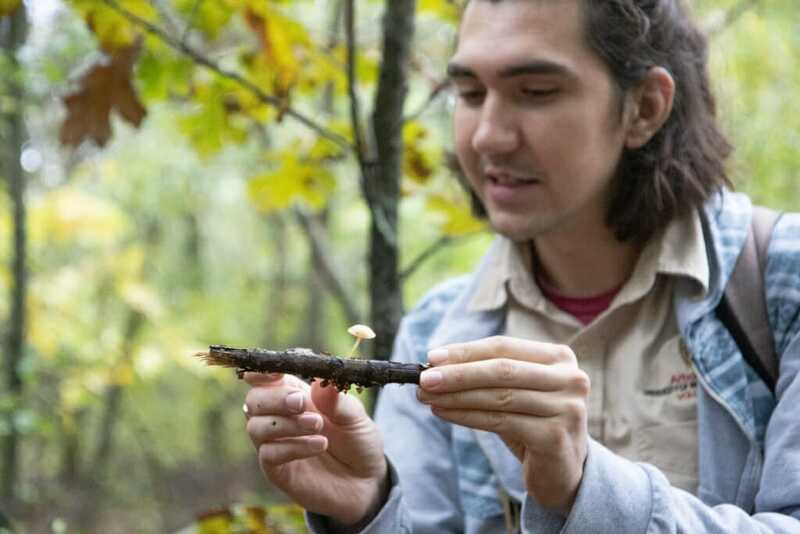 Now in its 44th year, the Smith Lake States Mycological Foray gathers mushroom experts to collect samples, share mycological gossip and debate the evolution of these enigmatic organisms. Based in the Upper Midwest, the foray travels around different states from year to year. 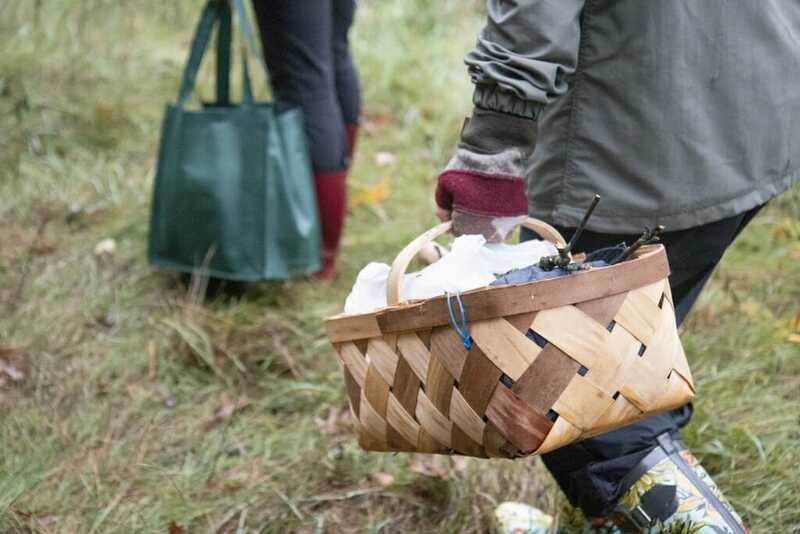 This year’s foragers bunked at the Hoofbeat Ridge Camps in Mazomanie. A fire roared in the mess hall on the first morning as the attendees prepared lunches and warily considered the rain outside. The wet fall promised plenty of mushrooms in the forest, but severe weather in the forecast threatened to keep the mycologists indoors. Yet by the time the parade of cars arrived at the day’s hunting grounds, the rain had largely lifted, leaving a mist hanging over the woods. 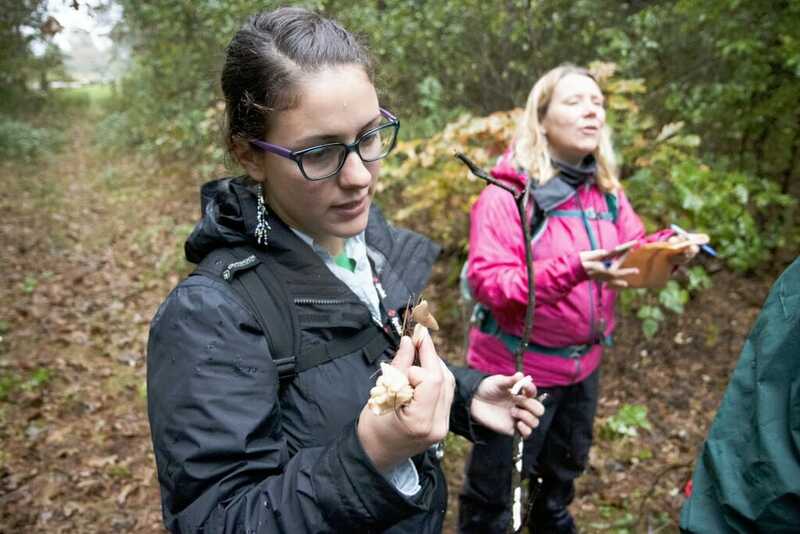 Inger Skrede, a mycologist at the University of Oslo in Norway, had come with her graduate student Dabao Lu in search of North American samples of Trichaptum abietinum, a shelf fungus that grows on logs. 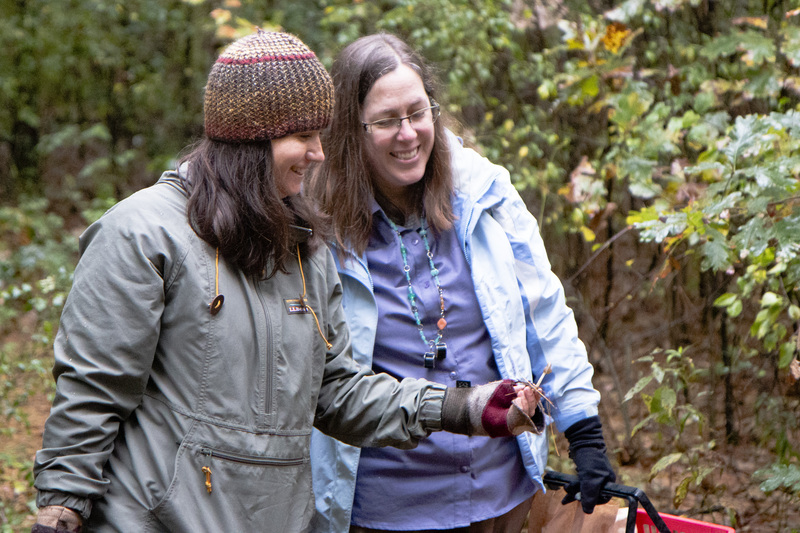 They joined several of Pringle’s graduate students and Marie Trest, a lab coordinator in the UW–Madison Department of Botany, to form one of several hunting parties combing the woods for the day. 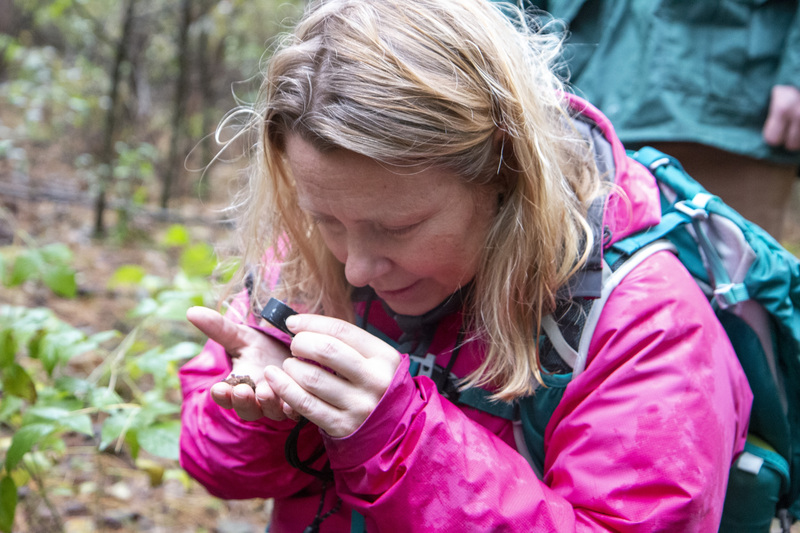 Making slow progress into the forest, Pringle’s team came across deadly galerina, edible blewits, destroying angels, and myriad other species shaped like corals, ears, and jellies. The finds included a puffball, which sent a spray of spores into the air when Pringle bent down to squeeze it. In a partial clearing, they spotted a series of interlocking fairy circles. These bizarre formations are made by one underground organism pushing up mushrooms at its edges with eerie symmetry. A buzz went through the group as they called over to Skrede, who grabbed a sample of one of the first Trichaptum finds of the day and drew it close to examine with a magnifying lens. The trans-Atlantic flight seemed to have paid off. To be a mushroom scientist is no easy calling. By far, most of a fungus’ body is hidden underground in a vast network of thread-like structures crisscrossing the soil. Only when it is time to send out new spores will a mushroom sprout, and only then can they be readily identified and collected. Which means mycologists will always depend on forays like this — and a little luck. In a meadow separating two sections of forest, Trest came across a broken branch covered in lichen. These symbiotic organisms made up of fungi and algae seem static, but can be full of drama, said Trest. Pringle gathered with graduate student Nora Duncritts as Trest pointed out the “algal rustling” happening in front of their eyes. In the lichen version of the Wild West, one lichen can steal away the algal partner of a nearby competitor, Trest explained, leading to a collage of colors across the branch. On the meandering return for lunch, Sam Harrow came across an Amanita mushroom. This infamous group of fungi are well known for their toxicity and hallucinogenic properties. Harrow, a graduate student in Pringle’s lab, had begun studying the Amanitas in the lab, but this was her first find in the wild. She beamed. Pringle explained that a definitive identification eluded them, however, because Harrow had separated the mushroom from its base, which is a telltale marker for different species. Back at the parking lot, the mycologists spread sandwiches and mushroom samples across the picnic tables, refueling for more hunting in the afternoon. 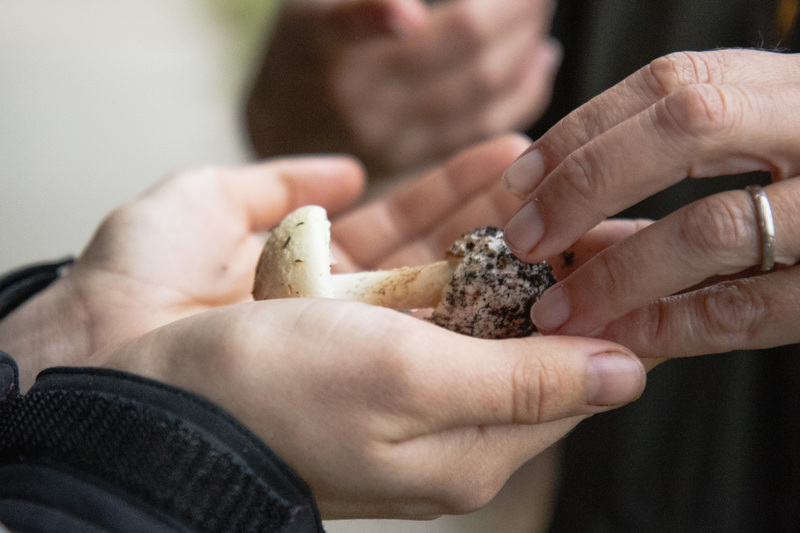 Some jokingly bartered for a portion of an enormous hen-of-the-woods gathered by one forager, one of many edible mushrooms — mixed among the toxic — gathered that day. Harrow caught up, showing off another Amanita, this one intact and easily identifiable. Pringle examined the mushroom and carefully handed the prize back to her student. The Smith Foray had a new adherent. Harrow was hooked.